Event details: Are you interested in new ways of experiental learning? How can we bring learners closer to nature through experiences? How to establish more friendly and effective relationship between humans and nature and also learn and work on teambuilding and social inclusion? How can the fun help in learning/teaching? How can you use a nature in learning/teaching process in the context of sustainability? 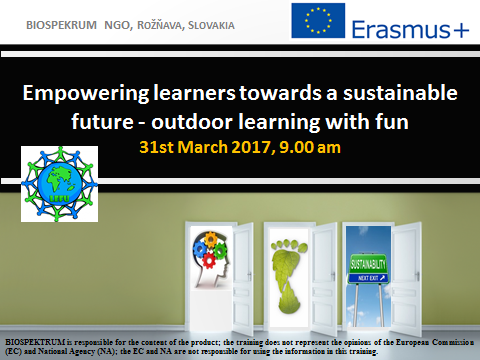 The aim of our training, available in Erasmus+ program as well, is to offer training in teaching outdoors in the context of development key competences in ESD. BIOSPEKTRUM NGO provides adults education trainings with great experience since 2006. BIOSPEKTRUM NGO implements projects for sustainable development and education for sustainable development (modern and innovation teaching methods). Our practice-oriented trainings are based on European best practices. A piece of nature offers several opportunities for learning and teaching, working on teambuilding and social inclusion, making friends, having programs together, relaxation… in a protected area… the possibilities are endless, if you can motivate people enough to learn. And what if you start teaching different subjects in the nature? You can not only make your education events more effective, varied and more exciting, but offer a greater chance for learners with learning difficulties or other disadvantages to experience success with the help of experimental learning. During our training you can acquire and practice the methods of teaching outdoors in the context of A holistic process of adaptation to the world. Who is this training recommended to? Mainly for educators, teachers, educational consultants dealing with children/students and for social workers, but everyone who is interested in the topic is welcomed. Which skills and knowledge can you achieve and develop at the course? • teaching different disciplines by the methods of nature-pedagogy, the methodology of learning outdoors – „learning with fun“ (based on a concreate experience, reflective observation, abstract conceptualisation and active experimantation• skills and values – that will allow you to work with learners/others in ways of integrative thinking and practice, develop of a set of categories of your competences in ESD that reflect a wide range of learning experiences: learning to know (the learner understands…); learning to do (the learner is able to do…); learning to live together (the learner works with others in ways that…. ); learning to be (the learner is someone who….). Tento obsah bol zaradený v Projekty a označkovaný ako Erasmus+, Rožnava, Slovakia. Zálohujte si trvalý odkaz.